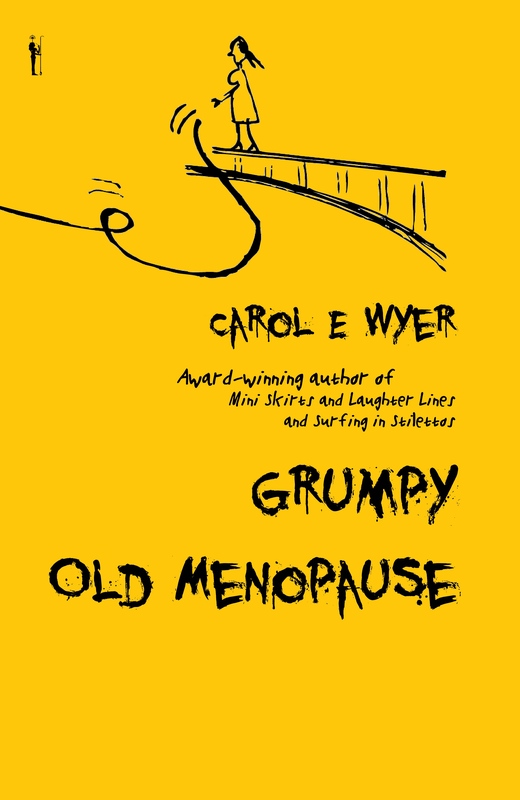 Grumpy Old Menopause: A Giveaway! A trip to buy boots became the catalyst for Grumpy Old Menopause. It was one January and while waiting for the young assistant to find the right sized boot, I suddenly had one of those moments…you know the one where a wave of heat starts at your feet, mounts your body and makes you want to peel off your very skin to get cool. I grabbed at my coat, yanked it and my scarf off, and my cardigan and attempted to fan myself with a receipt from a supermarket. The manageress looked over and nodded wisely. “I know what you’re going through,” she said in hushed tones, checking to see if anyone else could hear. She proceeded to tell me about a similar incident that had occurred for her. Out to dinner with friends, she had felt a hot flash and yanked off her jumper only to be greeted by astonished stares form her fellow dinner companions. She had inadvertently removed her blouse as well and was now sitting in only a bra. That lead me on to tell her about how I had woken up one morning to discover the hairs in my left eyebrow had gone…well, actually they’d migrated…to my upper lip. We chuckled, more stories followed and we guffawed like two teenagers, even more so when we were greeted with astonished stares from the assistant who finally emerged from the stock room with my boots. 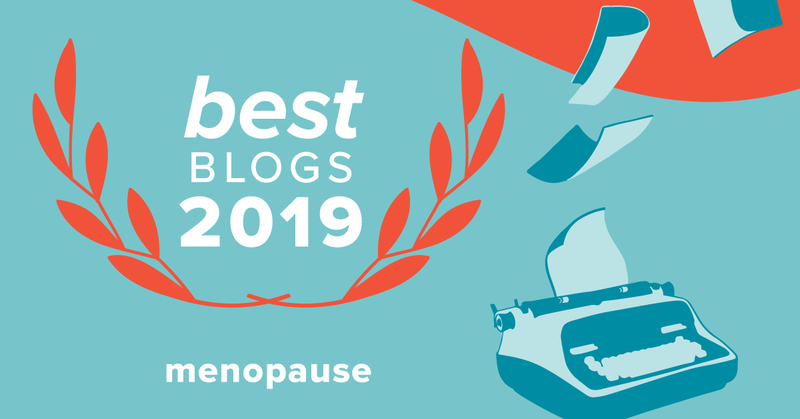 Well, once I’d left the store feeling a lot better about myself, I had a nugget of an idea…what if I could write a book that made people laugh about a subject that is still mostly taboo and help women going through the menopause? Grumpy Old Menopause takes its information from health experts, doctors and friends and personal experience. I trawled the internet for months looking for advice and articles (and stumbled upon Barbara’s wonderful menopausal plate article) about symptoms. I spoke to surgeons, gynaecologists, acupuncturists, alternative health specialists and many more, amassing material that would help. The whole book though, is supposed to be as close as you can get to sitting down with a friend and laughing at the tricks Nature is about to play on you. Laughter is your biggest weapon in your arsenal and if you are prepared for the menopause and can maintain a sense of humour, you will sail through it. I have…well, apart from the panic attacks, the insomnia, frozen shoulder and the hot flashes! In seriousness, there is a lot you can do about all of that as long as you have information and that’s what I hope to provide. One thing I have learned as I have got older is that laughter is a real cure-all. If you can have a good giggle you get a healthy workout, you raise feel-good hormones and you feel heaps better. The menopause is however, a serious subject and please don’t think I am glib about the problems and challenges that face many women at this time of their lives. I spoke to some ladies who went through early onset of menopause and had horrific symptoms so I am mindful of the passage some have to travel. I hope merely to inform, assist and support. I hope a few hours with book will at least bring a smile to your face and make you realise you are not alone. I have the book and my philosophy about laughter to thank for my latest career move…taking my own advice, I took up one of the many hobbies and suggestions I make in the book—stand-up comedy! (I couldn’t do pole dancing as I had frozen shoulder!) Yes, I now tour the UK with a comedy set entitled Smile While You Still Have Teeth. Whoever would have thought going through the menopause could be so much fun? 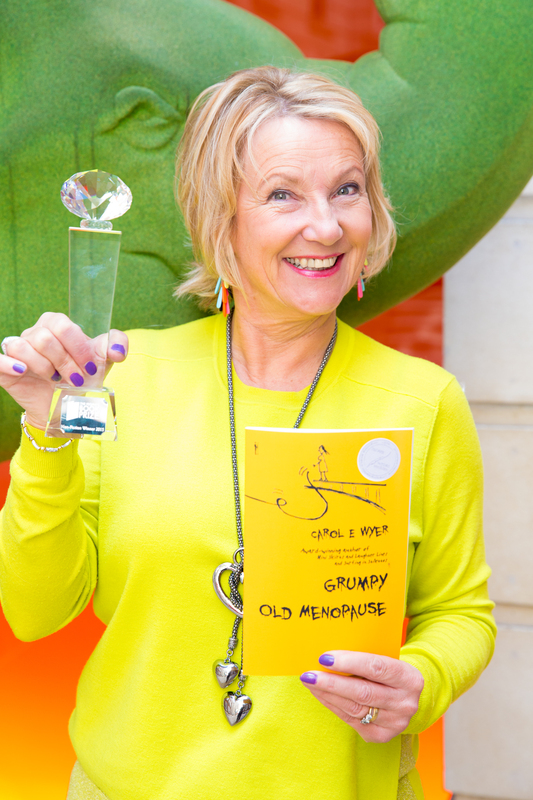 Giveaway: Grumpy Old Menopause has sold thousands of copies and been featured on over fifty radio shows, in magazines and on BBC Breakfast television. Carol is holding her award for winning the People’s Book Prize just a few months ago. For a chance to win a copy, please enter a comment by September 1. Watch Carol accept The People’s Book Prize award for Non-fiction on Youtube. Listen to some of Carol’s stand up entry for The BBC New Comedy Talent Award here. Carol E. Wyer wants to live in a world where gummy bears do not rot your teeth and everyone laughs at least fifty times a day. As a humorous writer and blogger, she’s been featured in and written for Womans’ Own, Yours, Choice, and Woman’s Weekly magazines, the Huffington Post and been interviewed on numerous BBC radio shows, NBC and Sky television and BBC Breakfast television. When she’s not hiding in her garret writing books and articles, you can find her quaking in the wings, waiting to perfom her stand up show, Smile While You Still Have Teeth or being a Loud Mouth on BBC Radio Derby. Next postWomen Backpackers: Pee Rags and More! The funny thing, to me, about menopause is how nobody really wants to talk about it – but, when you do, you end up giggling on the floor at the shoe store. Enjoyed the story. Good luck with the new book, Carol. I remember a time when my sisters and I sat in a restaurant in Chicago. One of us would rip off our sweater and then, when the hot flash subsided, put it back on. I can only imagine what we looked like to the other patrons, putting it on, ripping it off, putting it on, ripping it off. I would really enjoy reading your book! Even if you just want somebody to review it, I’d be happy to do so. Sorry for the delay in replying…my internet went down and I had more than one hot flush trying to get an engineer out to it. I was bright red by the end of the day! I’d love you to review the book if you have time. If you email me your address, I’ll get a copy to you. I can be found at author@carolewyer.co.uk. This sounds like a fabulous book! I’ve started to go through the desert of hell so I need all the help I can get! I have discovered that the more I talk about what I read here, the more my friends and I recognize that we are not alone! Laughter is truly the best medicine! Maybe with laughter, we can even overcome hot flashes! Hear, hear, Lisa. Hence I tried to make the book feel like the reader is chatting with or listening to your best friend or sister. Laughter is definitely the best way to deal with many problems, especially those pesky menopause symptoms. By the way, laughter can help hot flashes…it’s a great workout. You have to go for it though…lots of chuckles! I love this. The Erma Bombeck of Menopause. Great concept. Great idea. Laughter is really the best medicine. Good luck with the book. We do need to share our stories & enjoy a good laugh! It’s just the medicine we need ♡ Best wishes for success with the book! Thank you heartpeace. I have found the more I tell people, the more they open up…men too…sometimes its just nice to know you’re not alone. Bubby Joys and Oys, thank you. I am almost evangelical about laughter. It can help us in many ways. I took my own advice in the book and tried my hand at stand up…the resut was a routine called Smile While You Still Have Teeth and sell out gigs in the Midlands and a new career in making people laugh. Goes to prove that people love to laugh. I agree with you. Your book is groundbreaking because who laughs at menopause? And here you’re making us laugh! I also wrote a book about being a new and “inexperienced” grandmother and mother-in-law (haha) and all the blunders I made back then. After writing the book (“Mazel Tov It’s a Bubby”), I realized I still make all the mistakes but at least I can laugh at them! Hi Pam, Always fun to hear from you! Warm flashes sound a lot better than hot ones!